Auxiliary relay and Trip Relay is an electro-mechanical relay that operates on attracted armature principal designed to IEC60255. 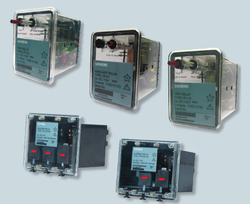 Auxiliary relay is available in 3 NO contacts and 2 CO contacts with self reset contacts type with or without flag. Trip relay low burden is available in 3 NO and 3 NC contacts. Trip relay high burden is available in 3 NO and 2 NC contacts with hand reset contacts type. Auxiliary Relay and Trip Relay is used in high speed operation which suits the requirements like transmission and industrial applications. Applications1.Trip Circuit Supervision Relay is used in the following fieldapplications:2.Used for monitoring activities. The trip circuit wiringis supervised from the positive supply to the negativesupply when the circuit breaker is in open position orclosed position. 3.Used for detecting and generating circuit breaker alarm,if the trip circuit supply is failed.4.Used to generate an alarm if the trip signal is receivedbut the circuit breaker fails to operate. 7PJ1524 High Speed Trip relay is a multi-contact attractedarmature relays designed to IEC 60255-1.- High speed, high burden, positive action, instantaneouscutoff.- 7PJ1524 trip relay allows to use the Trip CircuitSupervision relay (7PJ13) to monitor and supervise theintegrity of trip circuit with coil supervision terminal.- Supplied in draw-out type case.- Robust design for a long, reliable service life. High burden, Trip Relay SeriesHigh burden relays with immunity to capacitance discharge currents. 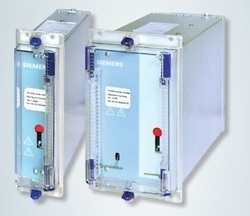 These relays are suitable for applications wherethey are located remotely from the initiation signal.